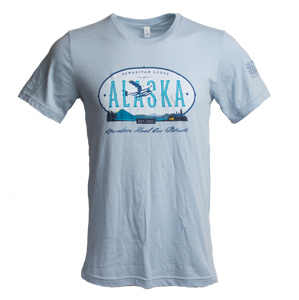 This gray-blue T-shirt depicts our seaplane flying over the beautiful mountains of Alaska. The plane transports military veterans and their spouses as they participate in a week of Gospel-focused marriage enrichment through our Operation Heal Our Patriots project. Due to popular demand, this item is temporarily out of stock. Please check back soon.